I believe a common mistake many people make is shopping for the "best deal", the "lowest price" and the "biggest bargain". Be careful, you might just get stuck with one. I understand that everyone wants a good price, a fair price and true value for their money. Your best solution is working with someone you trust that is knowledgeable and willing to share their expertise with you and stands behind what they sell. Assuming everyone selling diamonds is a qualified professional. Unfortunately, there is no federal or state qualifications, training, or licensing required for someone to sell a diamond. Many times the only training your sales person might have had is sales training. People hop around from job to job and are often new to the jewelry industry, perhaps selling shoes or whatever not that long ago. You should deal with an expert; a GIA Graduate Gemologist is best. When you have a question you will get the right answer. Thinking Color and Clarity are the major determinants in pricing a diamond. No doubt, Color and Clarity is important, but what makes a diamond sparkle is all about the Cut. The better the diamond is cut to exacting parameters of symmetry and polish, the more brilliance it will have. There are many factors that determine a diamonds beauty and value. A trained professional can help you understand the differences between diamonds. You will find sites that display enormous inventories, representing millions of dollars worth of merchandise, but the fact is that internet companies do not actually have the diamonds; they gather readily available diamond databases from other companies and post these offerings on their site. In other words, they neither own nor have ever seen the diamonds that they are offering to you and in many cases the diamond won't be available when you give them a deposit. Kenneth Gordon is a direct diamond broker, member of the New York Diamond Dealers Club and has access to the top diamond cutters in this country and abroad with literally thousands of diamonds available. Established connections along with the highest credit rating in the industry and low overhead allows us to use margins considerably less than that of Internet companies. I will find exactly what you want, at the right price, guaranteed. No one is more persistent than I am, just ask my wife. Not selecting the right engagement ring to fit your diamond. Worst scenario is a diamond that is too large or too small for the ring, or having it towering high above the ring. Some jewelers just don't know or tend to do what's easiest. 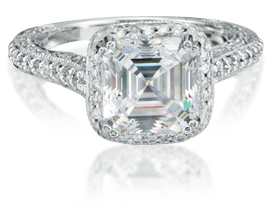 It is important to select an engagement ring setting that compliments your diamond. They should be proportioned nicely together and the diamond should fit as if the ring was designed specifically for it. 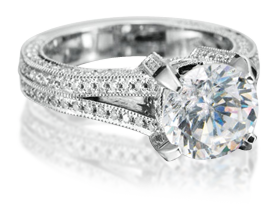 With a carefully chosen ring, you will not only have a beautiful diamond; you will have a gorgeous ring. A good jeweler will take the time to help you select the best ring for your diamond and set the diamond properly so everything flows together in perfect harmony. Not going the extra mile. Now is the time to splurge, being reasonable of course. This is a one-time purchase and you have to think about the long-term. Many people think that they will get a larger diamond down the road or get a simple setting now and plan to replace it later with what they really want. Years go by and it never happens. Don't settle for less than what you want. Your unhappiness will remain long after the price is forgotten. Don't do the second time what you could have done the first time. Do it right the first time and enjoy. Buying a diamond too low or too high in quality. There is nothing worse than getting a diamond and soon afterwards being unhappy with it. Then again, you don't need to spend extra money for such a high quality diamond that only a museum can appreciate. Selecting the right quality requires knowledge and the help and guidance of a good jeweler. Often times the Goldilocks' approach is best, deciding on a diamond quality that is just right. Assuming that a diamond can be purchased by the certificate alone. Your diamond purchase is a major investment, unlike so many purchases, a diamond is forever. It's important to get it right. All diamonds are unique; many times the same grade can be very different in appearance. There are many factors to consider, the polish and symmetry, the girdle thickness, florescence and proportioning among others. You should see the diamond in person, how it handles light and its overall beauty. Then make an intelligent decision. Assuming a diamond can be bought without professional guidance. No matter how much time and energy one devotes to trying to understand the intricacies of a diamond purchase, it soon becomes overwhelming. When it comes time to make your purchase, you will do business with someone you trust. A trusted advisor will help you make the best decision. Not getting the guarantees and customer service you deserve. For many people, an engagement ring purchase is the first important jewelry purchase they make. A lot of time and money is devoted to this purchase. But it will not be the last jewelry purchase made, other occasions will follow. Selecting a good jeweler that you can build a long-term relationship with is just as important as having a good doctor or accountant; it will be someone you can count on year after year. With a good business relationship you will be assured of receiving all the services that you need for today and down the road along with a commitment to caring for you, as a valued customer, with all your jewelry needs. Kenneth Gordon is that jeweler.